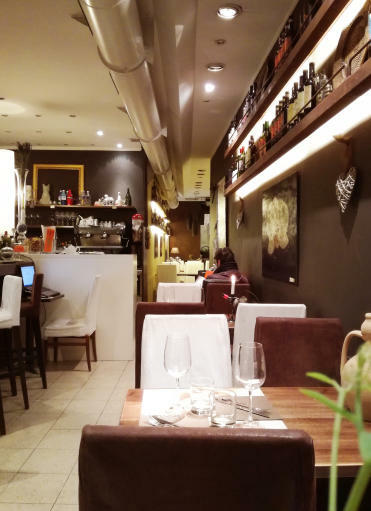 Restaurant with excellent Italian cuisine and wines. Friendly atmosphere for lunch, dinner, drink. This beautiful RESTAURANT in downtown Florence offering more than quarter of a century, looking hot and glamorous, suitable for dinners refined but not pretentious, for a quick and cheap lunch, but good and freshly cooked food, for APERITIFS accompanied by delicious appetizers ..... or just for a drink after dinner with friends. Excellent dinners with the first home flavors and genuine ingredients, the latter with choices meat, salads, burgers, all well presented and genuine ingredients. In the evening for dinner the chef offers well-prepared dishes and beautiful to see in an extremely relaxing atmosphere. you do not pay the covered.